Wind down your class with Pilates-inspired movements. Pilates instructors use many planes of motion to help students achieve bodies that can move and work efficiently. Movement awareness and proper execution are a large part of the equation. The same benefits occur in a well-rounded group exercise experience in which you introduce various movement planes. By doing so, you help participants be better prepared to move in life. Using your cool-down to help students transition from the group exercise class back to themselves and then to the outside world is a necessity. Most movement in a typical class is performed through the sagittal plane, where flexion and extension occur (running, walking, sit-ups, bicep curls, squats, etc). Working through different planes will enable students to develop more balanced bodies and help prevent injury. Try some of the following Pilates moves during your next cool-down. Start seated, cross-legged, shoulders over hips, arms by your sides; keep spine erect and abdominals engaged to support low back and pelvis. Bring one hand up toward ceiling and bend to side, allowing hand on mat to stay placed, elbow bent for support. Let rib cage initiate return to vertical, arm moving back toward ceiling and then back to floor. Repeat on opposite side. Modification: For tight hips, sit on a step. There are two ways to execute this movement. The first is seated, which is great for visual cuing. The second is prone, which is more difficult to understand as there are only verbal cues. Demonstrate while sitting first, to help participants visually understand extension, then try it prone. Seated. Sit cross-legged, shoulders over hips, hands resting on knees, spine vertical. Lightly press into hands and imagine your eyes slowly going up a wall, making sure not to overextend head and cervical spine. Feel top of sternum rise toward ceiling as scapulae gently glide down the back to support spine in extension. Drawing bottom ribs toward pelvis, return spine to neutral, eyes gazing forward. Prone. Lie prone, nose on mat, legs long, glutes active, forearms on floor. Finger tips are even with nose. Gently press into forearms and extend spine to where lower sternum barely comes off mat. Feel scapulae gently glide down the back, and maintain good head and cervical-spine alignment. Start seated on floor or with pelvis toward one side of a step (tight-hip modification). Spine is neutral, shoulders over hips, left leg bent and internally rotated, right leg externally rotated, foot touching top of left knee. Right hand rests lightly on floor. Left arm is to side, in line with shoulder. Rotate and flex spine, with arm following around in line with shoulder as if you were hugging a beach ball, then bring spine back to neutral and continue to rotate toward other leg, keeping arm slightly higher than shoulder. Repeat on opposite side. 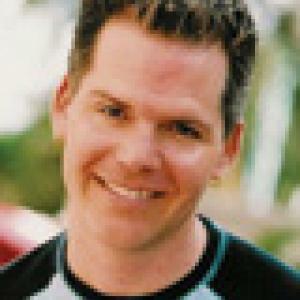 Matthew Comer, MS, is a STOTT PILATES® instructor trainer, and the founder and co-owner of Pilates South Beach. He holds a master’s degree in dance and movement therapy and is a continuing education provider for the Florida Physical Therapy Association. Matthew specializes in the postrehabilitation applications of Pilates. With over 20 years in the industry, he blends his knowledge of performance enhancement, movement analysis, dance, physical therapy and Pilates into one practice. Certifications: ACE and NASM ... read more.